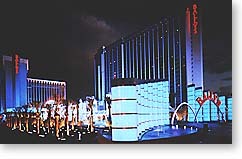 Located in the heart of the Las vegas Strip, Bally's offers its guests "A Touch of Class" with 2814 guest rooms and suites, 9 restaurants, celebrity entertainment. Featuring non-stop casino action, Race and Sports book, an Olympic-sized pool, state of-the-art work out facilities and spa, 8 lit tennis courts, world class shopping, and more than 175,000 sq. ft. of convention and meeting space. Bally's las Vegas has spent over $90 million in renovations. All Children 18 and over will be charged as an adult. There is a Maximum of 3 guests allowed per hotel room. Bally's offers you the choice between a King bed or 2 Queen beds.